The New Moon in Aries on April 5 kindles the star fire of inner soul force and determination in the face of collective events that feel overwhelming with their historical weight. Aries takes its name from the constellation of the charging ram, zodiacal terrain ruled by red hot Mars where our life and light giving Sun is exalted. Aries burns with impulsive heat that invigorates our passions and motivates us to take direct action. There is cosmic synchronicity of this propulsive force initiating a new lunar month during the same time that the combined impact of Saturn and Pluto with the South Node of the Moon in Capricorn is intensifying. Wielding the fire of Aries will not move mountains, suddenly change world politics, or be able to cut through every obstacle we face at this time. Yet we still need to claim the courage to use our force of will to shape the aspects of life we are able to create and guide, surrendering to the need to mediate the barriers and limitations out of our control. The Aries New Moon comes at the turning point of the astrological year. This is usually the case as in the northern hemisphere the season of Aries occurs during the rebirthing of Spring and the daily increase of light. However, in 2019 with the transiting lunar nodes and eclipses occurring in the signs of Cancer and Capricorn, the New Moon in Aries is occurring at the midpoint between eclipses while forming a change inducing square aspect with the Capricorn Solar Eclipse that happened on January 6, 2019 as well as the Cancer Solar Eclipse that is coming on July 2, 2019. This makes it an ideal time to recenter and regroup regarding whatever shifts have been taking shape in your life, summoning inner strength to respond to whatever needs repair or restoration. It’s also ideal for initiating and generating forward momentum and decisive action regarding whatever goals you want to achieve in the next six months. Hours after the Moon unites with the Sun, the waxing Aries Moon will move through a catalyzing square aspect with Saturn, Pluto, and the South Node of the Moon in Capricorn. Since the Aries New Moon is applying to a square with the transiting lunar nodes it means it is at its bending, in this case the southern bending in which the Moon dips as far south in latitude as it will reach during its lunar cycle. This is a maximum peak of volatility, and in a southern direction indicates a higher charge of unconscious impulses motivating behavior. A day after the lunation, just after the Moon has reappeared in light in its slender waxing crescent shape, the Moon will form a conjunction with Uranus in Taurus on April 6. There likely will be some explosive collective events during this time, yet on personal levels we will also need to be ready for rapid developments to erupt. The Moon is carrying an emancipatory charge that is facing the friction and resistance of large, oppressive societal forces. We can receive liberating, breakthrough insights during this time and by working hard to bring ideas into form we can cultivate greater strength in the process. At the same time, it will be necessary to be aware of the best use of energy in terms of what we can change and what we cannot. A day before the New Moon, the asteroid Vesta will ingress into Aries and begin applying to a conjunction with Chiron in Aries. The co-presence of the fiery communion between Vesta and Chiron with the New Moon in Aries draws awareness inward toward the most essential and rarified desires and values to focus attention on. What aspects of your life, what elements of your goals and dreams are irreplaceable and bring forth all of your strength and vitality to protect and nourish? During hard and difficult times when faith is tested, when natural disasters or collective calamities and crises strike, the gift offered is complete clarity regarding what matters most, where are attention needs full unequivocal engagement. Chiron and Vesta are inviting you to join them around their fire, a place of inclusivity, listening, sharing, and empowerment, a protective circle in which you can plant the seed of the vision you most wish to create and cultivate in the season ahead. Mars in Gemini rules the Aries New Moon, separating from a sextile aspect with Chiron in Aries and applying toward a square aspect with Neptune in Pisces that will not complete until April 25. Mars leaving Taurus and entering Gemini brings increased speed, electricity, and curiosity toward the striving will force signified by the red planet. With Mars in Gemini forming a whole sign sextile aspect with the New Moon in Aries, there is increased potential for taking action and making gains on whatever plans and visions have been taking shape during the Mercury retrograde in Pisces period that dominated the month of March. Mars in Gemini brings increased capacity to handle multiple tasks at a time and decipher connections between diverse interests, with the building tension between Mars and Neptune in April capable of severing awareness from an illusion. A main challenge will be keeping Mars from becoming detrimentally distracted in the airy home of Mercury. Mercury in Pisces is now moving direct as a Morning Star and finally beginning to separate from its extended conjunction with Neptune in Pisces that expanded visions yet restrained our capacity for quickly and clearly making needed connections and communication. Mercury at the time of the Aries New Moon is a week away from reaching maximum elongation as a Morning Star, meaning that we are entering the phase of Mercury in which we must gather the bravery, faith, and resources needed to embody whatever changes of mind and vision emerged into awareness during the past month. Mars in Gemini has the necessary flexibility to shift and mutate as needed as we figure out how to reshape and rebuild life structures. Yet Mars under the influence of Mercury combined with Neptune also brings risk of becoming inflated, self-righteous, and ungrounded, characteristics we will need to guard against especially if conflict erupts. There is a potent pulse of Pisces underlying the Aries New Moon. Just as Mercury is beginning to separate away from a conjunction with Neptune, Venus in Pisces is applying toward a union with Neptune that will complete on April 10. The combined influence of Venus, Neptune, and Mercury in Pisces has a multivalent impact which can range from the sublime to the delusional. The influence of Venus exalted in Pisces increases capacity for us to not only envision a reality in which we may behold soulful desires, but to also alter reality to bring about manifestation of deeply felt values and connections. Hopefully the long phase of Mercury retrograde in March helped clear minds of cobwebs and illusory conceptions, but as Mercury is finally separating from Neptune it will still be worthwhile to claim space for inner reflection and meditation to help enhance clarity. Jupiter in Sagittarius is ruling all of the Pisces planets and can facilitate inner knowing that supports their potential for inner vision as long as we center within authentic inner values rather than being swayed by external conditioning influences. As Venus forms its conjunction with Neptune on April 10, Mercury will simultaneously be applying to its third and final square aspect with Jupiter in Sagittarius. All of this is happening at the same time that Jupiter is stationing retrograde on April 10 at 24º21′ Sagittarius. When planets station their archetypal influence saturates the landscape, and so with Jupiter ruling Venus, Neptune, and Mercury it will intensify experience and meaning. The period of April 10 and 11 notably brings a higher degree of resolution to the wild journey Mercury has been on since February, as Mercury previously formed a square aspect with Jupiter on February 22 and March 24. There will be an opportunity for deepening into clearing or clarification of misleading beliefs while simultaneously receiving intimations of the course to follow into the future. Venus and Neptune will be playing the part of pulling awareness into the pleasures and wisdom of the senses and can be best utilized for soothing stress and creating an atmosphere of recovery, restoration and healing. The month of April initiates us into an intensification of the complex gravitas constellated by Saturn, Pluto, and the South Node of the Moon coming together in Capricorn. By the end of April, both Pluto and Saturn will have stationed retrograde with Saturn coming within three degrees of Pluto (Saturn and Pluto will not complete their conjunction until January 12, 2020). The deepening we experience in April into what to expect from the beginning of new cycle between Pluto and Saturn is amplified due to the transiting South Node of the Moon being in the same place, with Pluto conjoining the South Node of the Moon during the Aries New Moon and Saturn conjoining it by the end of April. These aspects alone would signify immense karmic issues erupting across societies, but the added influence taking things to an even more extreme degree is that the alignment of Pluto, Saturn, and the South Node of the Moon is also happening in the same area as the South Nodes of Pluto and Saturn. This means that the archetypal meaning of the entire orbital arcs of Saturn and Pluto are crashing down across the ecliptic, flooding events with their significations. We tend to imagine the lunar nodes as a dragon in astrology, yet what we have in this alignment is a three headed (or headless) dragon involving not only the lunar archetype but Saturn and Pluto as well. The shadow of the Self described in the work of C.G. Jung can thus be applied to all of global civilization, with numerous issues sweeping across global societies representing the accumulated toxicities and oppression built up from ages past. At its highest potential, this massive alignment offers opportunities for confronting societal issues and attempting to purify their intersection with us as individuals. Fundamentally, the New Moon in Aries points to the importance for each of us as an individual to claim responsibility for our behavior and intention, becoming accountable for the wider collective impact of our individual actions. While Pluto and Saturn have numerous negative and difficult significations, they also both connect with the empowerment found within our unconscious depths and our capacity to apply hard work and discipline toward manifesting and protecting what is most important to us, building or tearing down structures as needed. The New Moon is in the second decan of Aries associated with the Three of Wands card illustrated above by Pamela Colman Smith. As the second face of Aries holds the degrees of the exaltation of the Sun, we fittingly find a very solar image in this card of a heroic figuring overlooking a numinous landscape from a mountainous peak. There are ships heading off into the vast expanse beyond into other worlds for communication and commerce. Similarly, Agrippa’s Three Books of Occult Philosophy ascribed an image made for nobility, loftiness of kingdom, and a great dominion to the second face of Aries, and ancient texts are filled with the attribution of images linked to wealth and rulership to this decan. Austin Coppock in his book on the decans 36 Faces ascribed the image of “The Crown” to the second face of Aries. Coppock described the focus of this face as being “the world which emanates from an individual” and “the qualities which they choose to embody” (p. 59). Coppock wrote that the ability to create one’s own world found in this face leads to not only the attraction and magnetism of others of like-mind, but also to “the key to creating pocket realities which do not obey the laws of the collective reality field in which they exist” (p. 60). These associations with the second face of Aries work well with the New Moon in Aries having so much potent fertility for vision being offered by Venus, Neptune, and Mercury aligned in Pisces and being received by Jupiter in Sagittarius. The Hellenistic text the 36 Airs attributed Persephone to the second decan of Aries, an interesting association as she is also a noble figure who bridges the world of the visible and invisible, the goddess who rules the otherworld of soul, death, release, and resurrection. Additionally, the Persephone asteroid #399 is at 16º Capricorn and forming an almost exact square aspect with the Aries New Moon. Persephone’s presence with the New Moon calls us to honor being an eternal soul fully embodied within a material realm of continual life and death. While we must reconcile ourselves to living in a world of great suffering and death, grieving those who have passed on, Persephone also signifies our capacity for discovering newfound power and strength within ourselves in spite of the wounds we must bear. There is a further link with Persephone’s presence in this face with the sabian symbol for sixteen degrees of Aries where the union between Sun and Moon takes place: “Nature spirits are seen at work in the light of sunset.” Dane Rudhyar connected this symbol with “attunement to the potency of invisible forces, of nature,” commenting that these “nature forces act as guiding and balancing-harmonizing factors.” As one of the gifts astrology offers us is coming to terms with natural cycles so that we can flow and harmonize with them, we will need to keep in mind during April the necessity of both surrendering to natural processes of death and rebirth while claiming responsibility for doing what we can to shape matters and offer our own resources for support. Youth of delight, come hither / And see the opening morn, / Image of truth new born. / Doubt is fled & clouds of reason, / Dark disputes & artful teazing. / Folly is an endless maze, / Tangled roots perplex her ways, / How many have fallen there! / They stumble all night over bones of the dead, / And feel they know not what but care, / And wish to lead others when they should be led. Our ancestors for as far back as it seems we can imagine have honored the impact of eclipses. Anyone who has witnessed firsthand the blackening of the sun can attest to the otherworldliness conjured by our solar light becoming consumed by the multiplicity of night. When I witnessed the total solar eclipse in August 2017 that was visible in my homeland, Venus, normally shrouded by the rays of the sun, became unveiled in all her brightness at the midheaven of mid-day. Indeed, the quality of light during a solar eclipse is unlike any other, invoking a fertile matrix being opened within a dark void of the sky. Realities that have been hidden from our perception arise forcibly into our awareness, whether their source is from our unconscious or within external dynamics we had been unable to observe due to the glare from our subjectivity. Similarly, in astrology eclipses are known as times in which we experience an intensification of forms entering and leaving our life. Since the partial solar eclipse in Capricorn occurring on January 5 or 6 (depending on your locality) is the first of a series of Capricorn eclipses, it will bring an amplified introduction of new themes into our life while we simultaneously need to let go of numerous aspects of our old attachments and identity. Themes of release and purification will be especially emphasized as the eclipse is occurring at 15º25’ Capricorn on the side of the South Node of the Moon at 26º43’ Capricorn. We will have eclipses occurring in Capricorn and Cancer from now through the first half of 2020, and so one way to prepare is to become acquainted with the houses and aspects of your natal chart that will be effected. Due to Saturn in Capricorn ruling the eclipse less than four degrees away from the syzygy, an immense theme of discharge will involve your relationship with Saturn in Capricorn and concepts such as discipline, hard work, contemplation, mastery, authority, death, the dead, and the enduring. Your relationship with Pluto in Capricorn is also paramount, as the eclipse is applying toward a conjunction with Pluto and is close to the midpoint of Saturn and Pluto. Moreover, the eclipse is occurring within seven degrees of the south nodes of both Saturn and Pluto, with Pluto closely conjoining its own south node. To paraphrase some of Dane Rudhyar’s ideas on the planetary nodes, we are experiencing the essentiality of Pluto affecting our individual roots within civilization, both the putrefaction of plutonic toxicity as well as the creative empowerment that comes from claiming our inner authority within the collective chaos. As a result, it will be advisable to reflect and meditate upon your interface with Capricorn, Saturn, and Pluto. How are you feeling about your current ambitions, responsibilities, and how you have been measuring up with results? What aspects of your goals do you need to let go of in order to be more nurturing toward yourself? What patterns of behavior and perception do you need to purify or release in order to be more effective in pursuit of your aspirations? What do you need to release, remember, or regain from your past, or honor and bring back as a resource from your ancestors? Instead of focusing upon ambitious, external, worldly ideas of progress, are you instead being called to focus within your inner depths? From ancient times eclipses have been portrayed as a great dragon consuming our Sun and Moon, with the North Node of the Moon being its head and the South Node its tail. Like the ouroboros imagery of a dragon devouring its own tail in alchemy which mirrors the dissolution of nature seeding new forms, eclipses can also enhance our capacity to purify material attachments. Especially due to the Capricorn Solar Eclipse emphasizing the tail of the dragon, the headless Ketu, the emphasis will be on spiritual sacrifice and releasing fixations, entering the mysterious unknown. As the eclipse loosens the binding of the nodal knot, we may weave together new growth from the intersection between our past, present, and future. In addition to Saturn and Pluto playing enormous roles within the dynamics of the partial solar eclipse, Uranus is also holding a strange, impactful influence as it is stationing direct at the same time as the solar eclipse while forming a square to the transiting lunar nodes. Uranus at the southern bending of the lunar nodes is also forming a quincunx with Venus in Scorpio, which is notable due to the long opposition between Uranus and Venus that fertilized new meaning from September through the end of November. As Uranus stations direct in Aries for the final time (a transit that has been building since 2010), there is a fiery aspect of your inner light and vision wishing to break free and liberate you from any fear of fully committing to manifesting it. The barriers you feel are in the way, all your reasons for making excuses to not do it, will be obvious. Uranus wants to know what you plan to do about it anyway. Uranus is also in a 7th harmonic aspect to the Capricorn Solar Eclipse through a bi-septile. It’s not the only 7th harmonic aspect within the eclipse, as there is also a septile between Venus in Scorpio with Pluto in Capricorn as well as a tri-septile between Mercury in Capricorn with the North Node of the Moon in Cancer. My first astrology teacher Rosie Finn has described the 7th harmonic as an otherworldly descent of the strange and mystical, a dissolving of boundaries that creatively enables us to transcend everyday reality. With Uranus stationing while squaring the lunar nodes, this could feel more like the bizarre blasting into our life. By opening to letting go of some old attachments, we will clear space for something new to alter our sense of what is possible. Our ability to imagine the possibility of bringing inner dreams and visions into reality, no matter how strange, is further emphasized by the Capricorn Solar Eclipse forming a harmonious sextile aspect with Neptune in Pisces. Furthermore, Jupiter in Sagittarius is also applying toward a catalytic square aspect with Neptune in Pisces that will become exact a week later on January 13. This will be the first of three square aspects between Jupiter and Neptune (June 16 and September 21 will be the subsequent two), one of the dominant astrological themes of 2019 that provides a potent remediation of boosting capacities for imagining possibilities that counterbalances the constrictive influence of Saturn and Pluto in Capricorn. The dissolving, visionary influence of Neptune is mediating between Saturn and Jupiter all year, through a sextile aspect with Saturn and a square aspect with Jupiter. The square between Jupiter and Neptune is a waning one stretching back to the beginning of their current cycle in 2009, and therefore involves a deep change in what we envision is possible and the meaning of life we live from. These aspects also indicate disillusionment striking about civilization and our place within it; though these feelings can be difficult they also allow a reorientation to a deeper personal truth. Rather than having fear or anxiety underly vision, find a place of centered empowerment from which to cast your creative intentions and dreams into the unknown future. The influence of Neptune and Jupiter make the Capricorn Solar Eclipse potent in terms of revisioning the beliefs underlying your aspirations, opening yourself to the potential of creating more of the life you want to live in a way that also involves realistic steps for fulfillment. Mercury in Capricorn is co-present with the Solar Eclipse, Saturn, and Pluto in Capricorn and is headed toward a conjunction with Saturn. In between eclipses, Mercury will unite with Saturn on January 13, the same day as the exact square between Jupiter and Neptune. Mercury will them move on to form a conjunction with Pluto on January 18 a couple of days before the Total Lunar Eclipse in Leo that ripens on January 20. Mercury is hidden under the beams of the sun during this liminal time of eclipses, doing the secret work of the subconscious by mixing together the meaning of Saturn and Pluto being enveloped by the eclipse. It’s an alchemical role for Mercury to play, and in Capricorn while applying to Saturn there is incredible thoroughness willing to soak up the sentience of stone within the dexterous movements of Mercury. However, Mercury is also applying to a catalytic square aspect with Mars in Aries at the time of the eclipse, adding an impulsive, initiating quality to the work of Hermes. If there is a great ambition you are harboring within to manifest in 2019, Mercury is in ideal position at the eclipse to bring your attention to the hidden, underlying issues at its root. No matter your intentions, Mercury will be probing under the surface of your daily routines and effort noticing where there can be greater efficiency and effectiveness. Due to the friction between Mars and Mercury, there can be inspired communication but be careful to not needlessly provoke conflict or rush off into an enterprise before you are properly prepared. Venus remains a beacon of bright light before sunrise, and has finally reached the final degrees of Scorpio at the time of the Capricorn Solar Eclipse. Venus has separated from Ceres in Scorpio while forming a watery triangle with Chiron in Pisces and the North Node of the Moon in Cancer. We will have opportunities to grieve loss, soothe our old wounds, and take responsibility for our part in past dynamics, but there is a vital quality of Venus at the eclipse beckoning us into the present in order to bring value to what needs our attention in the here and now. In the forthcoming waxing of the Moon, Venus will be entering Sagittarius and then heading toward a union with Jupiter which will culminate at the same time as the upcoming Total Lunar Eclipse in Leo. Venus is drawing us to engage with the type of epic vision that Jupiter in Sagittarius loves best. Amazingly, while we will have a union of the benefics, Venus and Jupiter, during the upcoming eclipse season, we will also experience the malefic friction of Mars and Saturn forming a change inducing square aspect at the same time as the upcoming lunar eclipse. Mars in Aries forming a square with Saturn in Capricorn can demand direct ordering and coordination that enables a quick and smooth implementation of plans, and if we are not careful we can burn under its glare for not meeting expectations of optimal performance. However, with Venus and Jupiter also uniting in Sagittarius we are being asked to imbibe the integrity of our essential values and meaning into whatever we are working on, being willing to patiently wait for a more natural manifestation of form. At its best these aspects support putting in disciplined exertion to a craft or art we have filled with meaning and purpose, focusing on the intrinsic motivation of creation rather than external judgment. The Solar Eclipse falls in the second decan of Capricorn associated with the Three of Pentacles card illustrated above by Pamela Colman Smith. In the image of the Three of Pentacles we see a skilled sculptor in process of creating a divinely inspired masterwork in a monastery. There is a consultation taking place between the artisan and authorities associated with the institution, with carefully drawn plans for the masterpiece on display. Fittingly, Mars and Venus are the co-rulers of the second decan of Capricorn, as it is a face in which great works can be created through collaboration, careful planning, and incredible effort bonded with artistic vision. 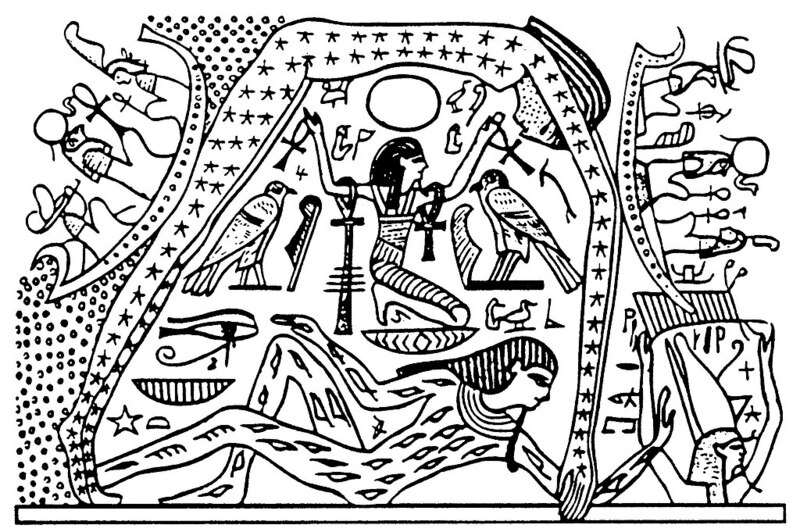 Austin Coppock in his book 36 Faces ascribed the image of “The Pyramid” to the second decan of Capricorn, noting it is a place where sublime works of material manifestation are completed. Coppock wrote that as the focus of this face is on “structuring the territory itself,” there is a necessity for blueprints as well as hard work in collaboration with numerous resources if we want to complete our grand vision. Coppock wrote that while there is a necessity to bind our effort to the form and guidance of a blueprint, he also cautioned to take care in the “enduring consequences” created by becoming consumed by the creation of a grand magnum opus. Coppock described the need to distill ambition from hubris in order “to achieve purity of purpose,” a worthy separation to keep in mind as we tangle with the tail of the dragon in the Capricorn Solar Eclipse. Capricorn involves the maturity and responsibility cultivated through facing and dealing with natural cycles of change, listening within for when it is time to act as well as refrain from excessive activity. The Capricorn Solar Eclipse has the unique astrological timing of initiating us into the starry themes of 2019 at the same time that the human designed calendar begins, not long after the rebirth that comes with the solstice. Though we know that our societies are formed by laws, regulations, norms and taboos designed to create a stable whole, we sometimes forget to reflect upon how our conformity to societal norms can limit our essential growth and make us too concerned with external judgment. As the sun becomes partially eclipsed by the moon, we can likewise retreat within our own darkness to reformulate how we work with time and space in creating our world. Jung, Carl. (1967). 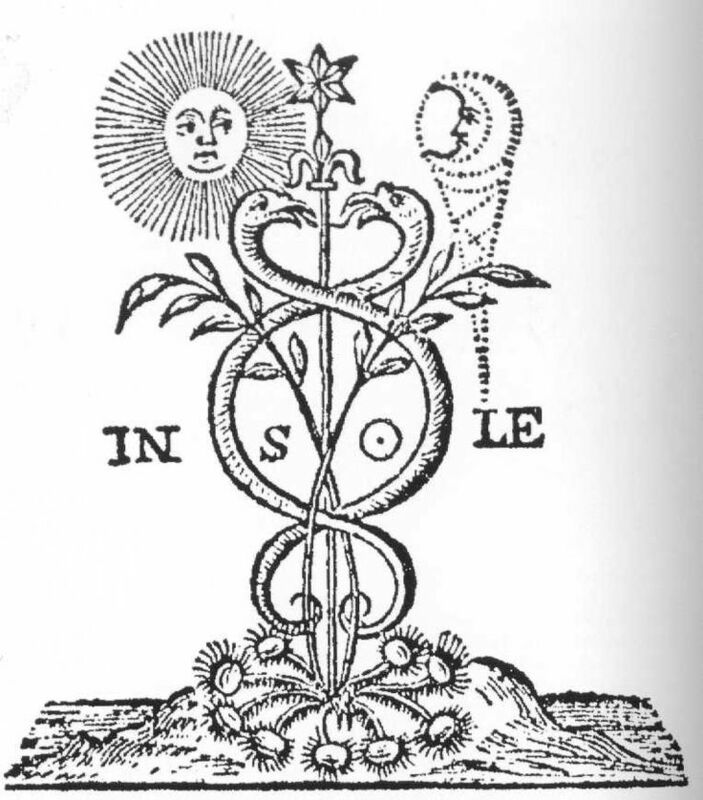 Alchemical Studies. Bollingen. Jung, Carl. (1965). Memories, Dreams, Reflections. Recorded and edited by Aniela Jaffe. Vintage. Kingsley, Peter. (2018). Catafalque: Carl Jung and the End of Humanity. Catafalque Press.